As many will already know, the draft Phase 2 of SA’s labelling and advertising regulations descended from government printer cyberspace on May 29 in the form of R429. What’s up now? 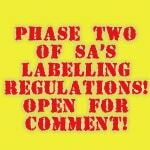 Nigel Sunley, one of SA’s foremost labelling and regulatory experts, offers cogent insights and commentary on the new proposals, and advises strongly that, if you want to submit comments, you’d best get busy. Read on! The sudden, although not unexpected, arrival of R429 gave those of us who work in this area a seriously disrupted weekend doing the proverbial ‘read, learn & inwardly digest’ exercise. The proposals have been much anticipated with the only virtual certainties being that they would also replace (and hopefully improve) the existing R146 and that nutrient profiling would be a key component of the proposals and become a significant part of the landscape for food-beverage product development and marketing for the foreseeable future. The remainder of the proposals have been shrouded in secrecy, so it is good to get our hands on them and look at the implications for our industry. My first take of R429 is that it is a significant and quite refreshing improvement on earlier attempts to impose some order on the chaotic world of health and nutritional aspects of food, and that it has managed to tread a somewhat wobbly, but generally pretty acceptable, line between protecting the consumer and providing the industry with reasonable opportunities to promote the beneficial effects of their products. Before plunging into this jungle, let’s however firstly look at the other major objective of R429, namely to tidy up R146 and remove some of its grey areas and ‘funnies’. There is a vastly expanded set of definitions which will certainly help in this area (although dietary fibre and the whole area of carbohydrate classification is a technical nightmare whose correct interpretation will be unbelievably complex) and there are improvements and clarification in areas like prescribed letter sizes, endorsements and the removal of various anachronisms such as vegetable fat descriptors, the classification of milk as ‘cow’s milk’ and the confusion regarding botanical names of gluten containing cereals. One potential time bomb is the issue of religious endorsements, where it is clear that government have come under pressure from activists with a bone to pick in this area, resulting in a requirement for products both with and without religious endorsements to be available – it will be interesting to see how this develops, as emotions will clearly run high. I have a lot of sympathy for the Dept of Health who is going to be reluctantly caught in the middle of the debate! On the nutrition side of the R146 improvement exercise, we have a bit of a mish-mash of good, bad and ugly. The good is unquestionably the requirement for compulsory nutritional information other than for home industry products – a sensibly pragmatic view as enforcement in this area would be virtually impossible, as long as we are clear as to what a home industry actually is! Coupled with this are some minor but helpful tidying up of some aspects of the nutrition information table format along with improved clarity as to sources of nutritional information, which can only help manufacturers who, for whatever reason, wish to calculate rather than analyse for nutritional information. d. Costing the industry large amounts of money for unnecessary analysis and for which values are not published in any nutritional tables – so calculation of some significant components of nutritional information is effectively impossible? It is staggering that, after the frustration and debate over this issue that we saw during the run-up to R146, this unnecessary and pointless requirement is retained in R429, particularly when there is so much good stuff and pragmatism visible elsewhere in these proposals. Enough moaning – what about the new proposals for claims? Well, there are literally pages of tables of claims with prescribed wordings and conditions for use. GI is there (admittedly after it has continued to be freely used by the industry on tenuous legal grounds ever since the advent of R146) along with nutrient function, disease risk reduction, whole grain, oral health, physical performance and slimming-related claims – the last in particular is a complex and contentious area and will require particular scrutiny in view of the cowboy activities that have been prevalent in this area in recent years. As expected, nutrient profiling is there as a screening mechanism and will hopefully also become a more broad-based tool for use in the whole area of nutritional improvement. There is also provision for front-of–pack nutritional labelling and first impressions of the proposals in this area are good and suitably consumer friendly. In general the provisions are generally well set out, but the sting in the tail comes with what is clearly the first of many salvos from the anti-sugar and sweetener lobbies against the soft drink industry in particular – when the words ‘diet’ and ‘zero’ are specifically mentioned as being prohibited for use in slimming claims, one can only assume that a certain, large multi-national company is making some pretty swift calls to its legal eagles! Another area of major concern is a proposed blanket ban on claims for any products containing added fructose, non-nutritive sweeteners and caffeine, with the non-nutritive sweetener component particularly contentious and, indeed, illogical when these products are specifically being used to replace the much-denigrated sugars that are, rightly or wrongly, taking more than their fair share of criticism from the more radical side of the nutrition and public health communities. Surely the DoH has not been consorting with loony anti-aspartame activists and their scientifically-vacuous internet drivel? I foresee a battle royal on this front! It is also surprising to see absolutely no provision for the potential assessment of any new health and nutrition claims. It is widely acknowledged that South Africa does not realistically possess the resources to run our own comprehensive assessment system, but why not include a provision that approves any claims and their conditions and prescribed wordings that have been approved by EFSA or similar bodies? Do we have to wait for the law to be changed every time a new claim is approved by globally-reputable assessment bodies, or should we rather not follow the sensible approach currently being progressively introduced by the DoH in the area of food additives, where any additive approved under the Codex General Standard for Food Additives becomes automatically approved for use here with appropriate prescribed categories and related dosages? Much to think on therefore and much to digest, including no less than 17 guidelines! Interesting times ahead and, with only three months to comment and no guarantee that the comment deadline will be extended as it was in 2007, we need to get our skates on and get those comments in. There is a lot that is good in R429 but also a number of components that need to be challenged using constructive and scientifically-sound comment. Click here on the FACTS SA website to download a copy of R429. Before you print, note that it is 112 pages long! You can contact me, brenda@foodstuffsa.co.za, for a copy of the guidelines.